Cloud/fog water samples were collected at Daekwanreung (840 m msl), a ridge site, in South Korea, from March 2002 to September 2003, by using a Caltech type, self fabricated active strand cloud water collector. The pH, electrical conductivity and major ion concentrations were analyzed. The cloud water pH ranged from 3.6 to 6.8 with an average of 5.2, which was close to the atmospheric neutral point. However, the pH calculated from average concentrations of H+ was 4.7, indicating the cloud/fog water was weakly acidified. SO4 2−, NO3 − and NH4 + are predominant ions of which average concentrations were 203.1, 128.1, and 211.7 μeq⋅L−1, respectively. Samples were categorized into four groups by applying 48-hour back trajectory analysis, using the HYbrid Single-Particle Largrangian Integrated Trajectory (HYSPLIT) model. Chemical compositions for the four cases significantly differed from each other. For air masses transported from the East Sea (group E), sea salt concentrations, including Na+, Cl− Mg2+, were relatively high. Principal acidifying pollutants, such as NO3 − and nss-SO4 2−, significantly increased in the case of air masses transported from the Northeast Asian continent through North Korea (group N) and air masses from the Seoul metropolitan area (group W). However, the mean pH of group N was the highest while the mean pH of group W was the lowest. 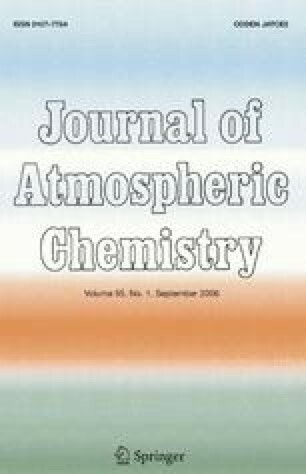 This suggests that most NO3 − and nss-SO4 2− in cloud/fog water was neutralized by ammonia and calcium compounds under the influence of air masses transported from Northeast Asia. N/S ratio for the group W was significantly higher than those for the other three groups, suggesting nitrogen species transported from the Seoul metropolitan area contributed to acidification of cloud/fog water at Daekwanreung. Principle Component analysis (PCA) was applied to the cloud/fog water data for presenting characteristics in the four different categories. Draxler, R.R. and Rolph, G.D., 2003: HYSPLIT (HYbrid Single‐Particle Lagrangian Integrated Trajectory) Model access via NOAA ARL READY Website (http://www.arl.noaa.gov/ready/hysplit4.html), NOAA Air Resources Laboratory, Silver Spring, MD.